So let's get back to electronics and all that other good stuff! So I want to build a some kind of electric vehicle, so I thought it would be a good idea to learn how to build a brushless dc (BLDC) motor controller and how to control a brushless dc motor. Why brushless and not induction? Well, first of all, as of my background in RC, I can use one of my RC motors to test a controller prototype and I know where I can get bigger RC motor with more power if I need it. Plus BLDC motors are simpler to control than induction motors, so that was also a big factor why I decided to start from here. I'm scheduled to graduate spring 2016, so I hope I can you give you guys a nice project log on how this will be progressing from here. I also want to use this controller and a motor to build a small scale electric vehicle. I choose small scale with the simple reasons as: Cost, less of everything tends to be cheaper than a lot of everything. Complexity, keep it as simple as possible, but not too simple. Scaling, what you learn here allows you to scale what you have learned later to larger scale. With these attributes in mind I started to think and look for a mechanical platform, which to convert to EV use. At this point I want to point out that we want to keep everything as simple as possible mechanically, so don't expect anything aesthetically polished implementation. 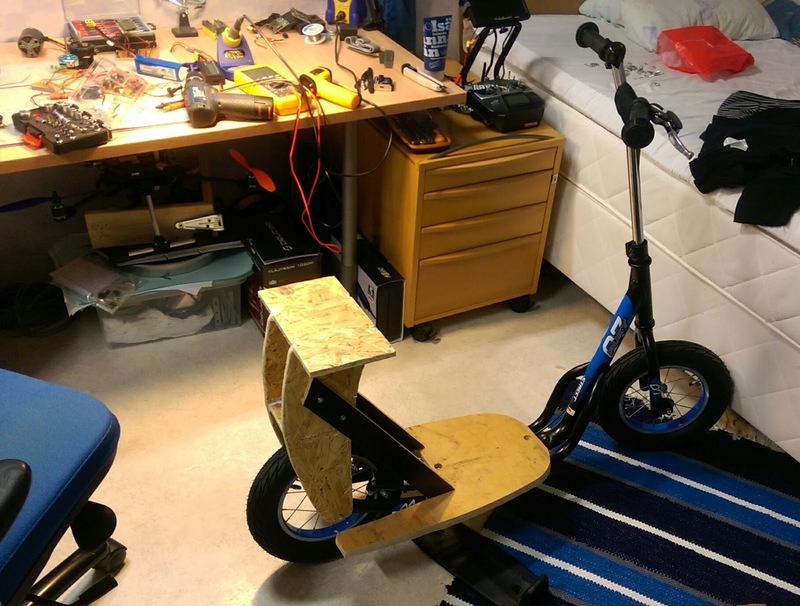 Possibilities were realistically limited to a skateboard (longboard), a kickbike or a bicycle. Skateboard was an interesting option after seeing the success of the American "Boosted boards" kickstarter campaign, but especially after seeing the two videos below. This guy is just so cool cruising around with this thing! In both of these videos they are using the Boosted boards, but to me this does present a sliiiight challenge... I can't skateboard. So that is something that I would need to learn, but as an added interest there was the need to make a wireless controller for the throttle. Personally that also interested me, but after getting sponsoring from the company I work for, Prenta Oy (site in finnish), which designs and manufactures 3D-printers. They encouraged me to ditch the skateboard idea, simply because general public can't skateboard, so it wouldn't have as big of a market demographic if it were to be commercialized. I found the reasons justified and the skateboard was abandoned. Next I started to look into a bicycle as a platform, but that was quickly ruled out, as there really weren't any that cheap of bicycles available in the market with sensible geometrics. The powertrain from the motor to the wheel also presented quite a challenge, which we were not ready to undertake and so the bicycle was abandoned. So kickbikes it was, or scooters as they're called (not the artist ;) ). Searching around google in the finnish market produced a lot of the small wheeled kickbikes, but they were decided to reject, because the small wheels would not perform well for long distances on sidewalks with bumps, gravel and miniscule pebbles would probably make it polevault. Now, I'm going to put emphasis on this. There is NO telling what kind of monster/freak/mutant of a electric kickbike we are going to end up with! But be assured! Atleast it's gonna be crazy fast!